Penske Commercial Vehicles has announced the appointment of Mark Mello as General Manager of Man Truck and Bus in Australia. Mello joined Man in mid-2000 and has fulfilled a range of roles during the past 14 years initially as the National Service Manager for Man, before moving to management roles in dealer development, after market, retail, special projects and operations. Penske Commercial Vehicles Managing Director Paul Glavac says Mello brings vast extensive experience in trucks to his new role, both at Man and prior to that at Volvo Australia. 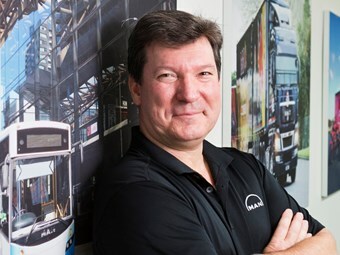 "Along with his involvement in Man bus and military vehicles during the past few years Mark is perfectly equipped for the task of spearheading Man truck and bus in Australia," says Glavac. Mello says he is honoured to be appointed to the role particularly given the extra breadth and added resources the Penske Corporation has brought to the operation in the past year. "My background is in truck and whilst I have been primarily involved in bus and military vehicles in recent times I have always kept a close interest in trucks and I am looking forward to helping Man to achieve greater success in Australia," he says. "There is no doubt that Penske Commercial Vehicle has brought greater opportunities and resources for Man in Australia particularly with rental and leasing operations which combined with the Man product line up will ensure we deliver on the tremendous potential the brand has here in Australia."